If the classic Apple docks are just too plain and simple for you, then FuseChicken’s Une Bobine is a great replacement for your iPhone docking needs. 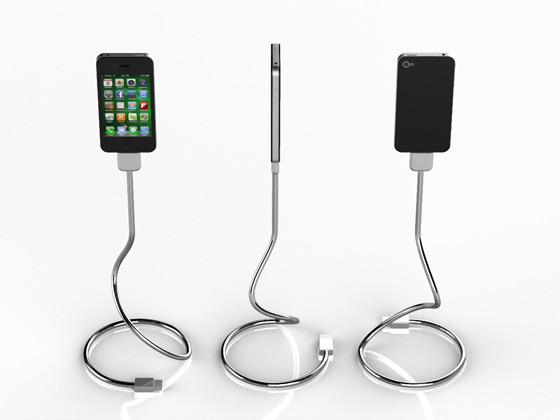 Simply stick it on the dock and bend the cable whichever way and angle you please. It also acts as a fantastic stand since you can manipulate it to fit all of your needs; placing it in front of you or in landscape mode lets you have a much more comfortable viewing angle. This Kickstarter project has exceeded its funding goal and will be available for shipping around 2 months from now. If you can’t wait to get your hands on one of these, you can pledge $25 on Kickstarter to preorder this unique accessory.